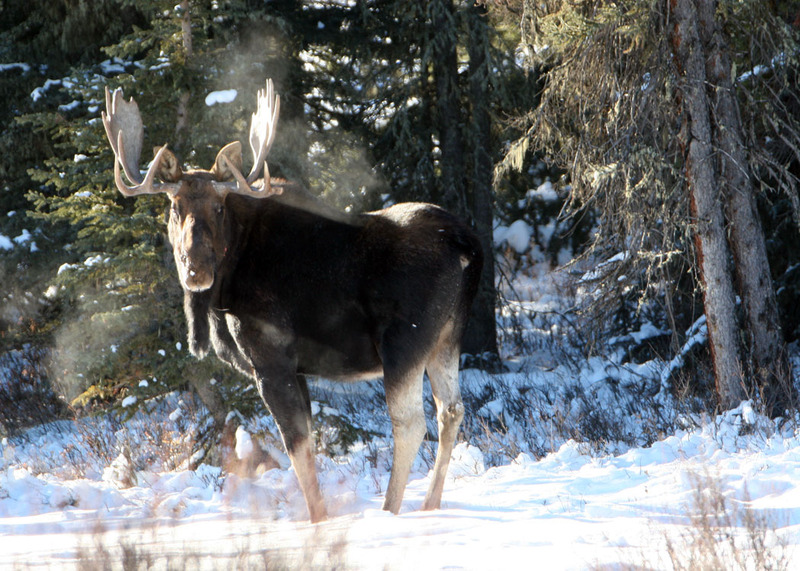 Winter in the foothills of Alberta has settled in. Most of the creeks and muskegs are frozen and covered with snow. 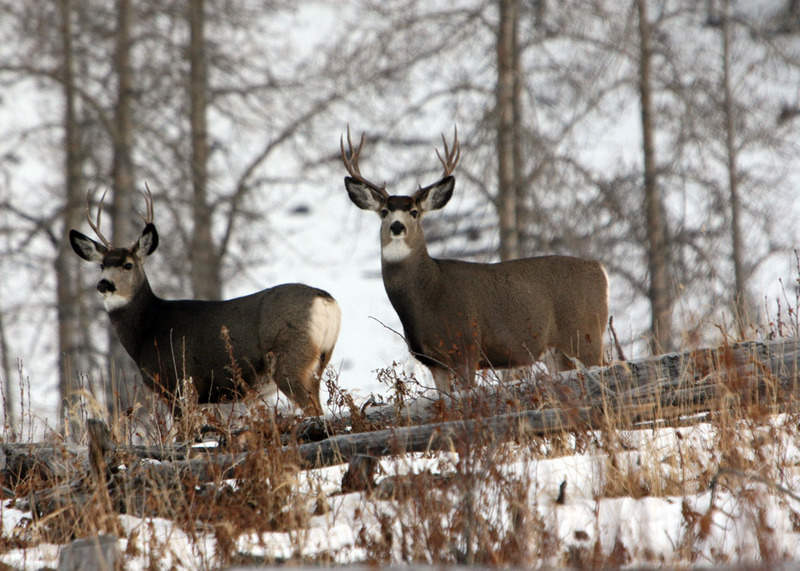 The fall hunting season has concluded and all of wildlife and horses have settled down as the quiet has returned to this beautiful area. It is also nice to report that in our travels so far, we have come across no wild horses that were injured or killed by poachers. 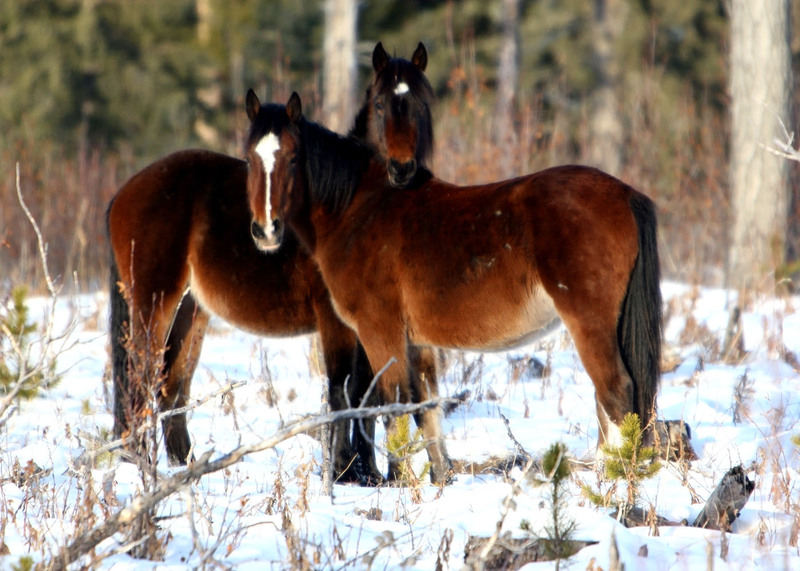 However the Alberta Horse Capture Season for the wild horses began on November 1. From this date individuals are allowed a permit, to run down and rope wild horses for capture. 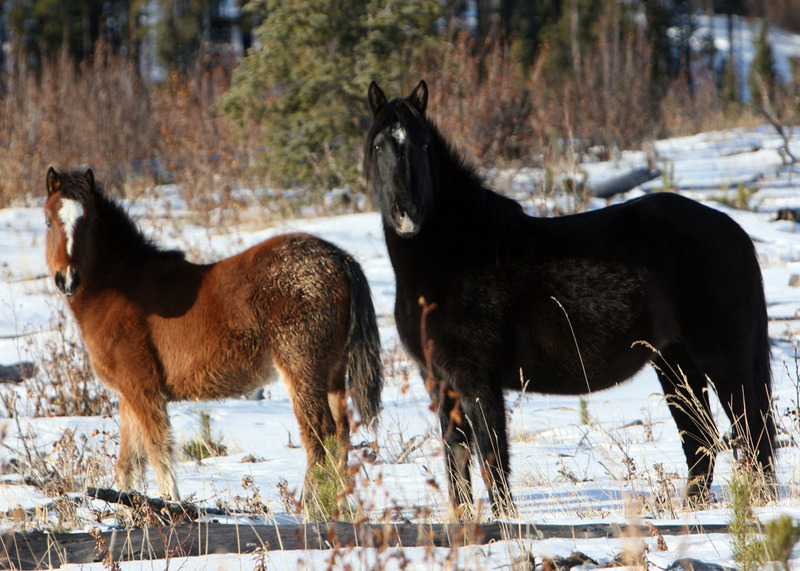 WHOAS believes that this an extremely cruel method of capture for the wild horses. 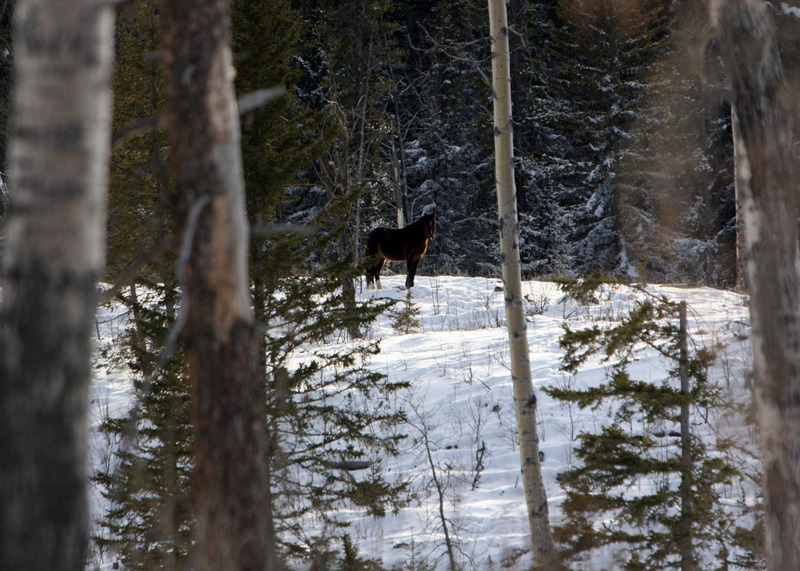 It is not only a danger to the wild horses being chased across these clearcuts full of debris and coverd by snow, but also to the mounts of those, that think that it is sport. I do not believe that you have to prove yourself in this manner at all in this day and age. Attempts by WHOAS to lobby the government to remove this method of capture has fallen on deaf ears. Then on December 1, the season started where a permit holder is allowed to build pens and lure the wild horses in with hay and salt. A trip gate slams shut as soon as a horse in this capture corral touches the salt block. The wild horses in the corral cannot escape and are at the mercy of the permit holder. With the price of horses being very low, one does not have to guess where the captured horses will end up. This season runs until February 28 in the following year. The limit under the regulations is suppose to be one mare to three studs, but this is not always followed. In fact we know of one permit holder last year who was told he could just ignore this part of the regulations and take what he caught. It was our government officials that gave him this direction. As in the past we have found and have also been told that they are just regulations, therefore they can be interpreted as they deem fit. I was always taught that the law is the law and it should be respected by everyone at all times. The good point is that so far in our travels we have yet to find any capture corrals, but of course the government agency in charge will not tell us what permits have been issued to who or where they are allowed. Enough of that news and on to the happier news. As my friend Fran and I have travelled the back trails all through the fall and now into winter we have found the horses to be in excellent shape so far. The mares are still nursing their young foals, but as winter progresses and their body reserves diminish the foals will be slowly weaned off. By that time though they should have the strength to endure the hardships of winter. 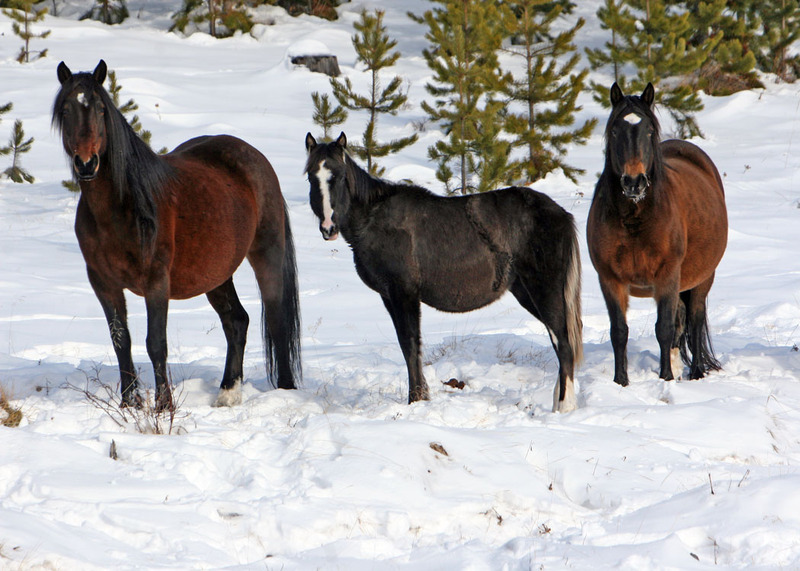 The intial snow fall of 12-15 inches is still soft, but settled, which makes the pawing for forage easier for the wild horses and other wildlife. This winter the horses are not as concentrated as they have been in the past and Fran and I have had to put on many miles looking for them. They definitely are not as easy to find as in other years. We have also tried to find two of the foals I had mentioned in earlier blogs but in the past three trips have not been able to locate them. We will continue to check for them as the winter wears on. Fran is new to these wild horses and her first time seeing them was a thrill for her. As we sat looking at a herd and I as I was taking pictures, two younger members of the herd came right into her, trying to see who this was sitting so still looking at them. The smile on her face precious. I have seen others that I have introduced to the wild horses, be captured in their spirit with pure excited pleasure. Fran like myself has fallen for these magnificient and beautiful horses. For myself, it is so nice to take people out that do appreciate nature in all her beauty and solitude, along with all the other creatures that inhabit this wonderful landscape. As the winter continues we will continue to travel out west to check on the welfare of the wild horses and to photograph them more. That way I can keep you up to date on how they are managing through the winter season. 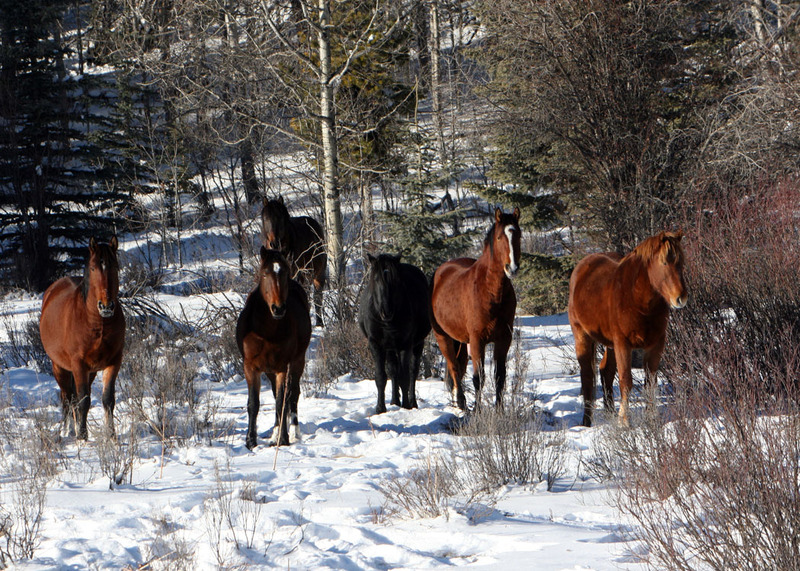 At this time I would like to, on behalf of WHOAS and the WILD HORSES of ALBERTA, wish all of you, Seasons’s Greetings and all the best in the New Year. Thank you for your continued support and we do have a few calendars left for sale, if you wish to purchase one to support our efforts to save natural heritage, the wild horses. Thank you. They say thank you too!